Heads Up, Hop Up is the fifth level of World 1 found in Yoshi's New Island. Yoshi starts the level in a grassy area with a Tap-Tap, an Egg Block, and a pipe nearby. The pipe leads to an area with a platform network and some Winged Clouds, one of which holds an arrow platform which can be used to propel Yoshi higher into the area. 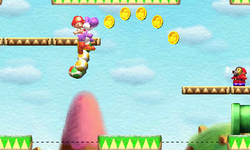 After navigating past some more moving platforms and enemies, Yoshi reaches a pipe which can be entered to bring Yoshi to the Goal Ring. Russian Все выше и выше! Vse vyshe i vyshe! Higher and Higher! Wiro Wiro Ollagaja! Climb Up and Up! This page was last edited on April 15, 2019, at 12:03.